A disconcerting trend has hit Montreal’s party scene, as more and more promoters have decided to ban ravers from attending their events. Following in the wake of several high profile drug related deaths at BIPLO, America’s largest and most successful electronic music festival, promoters are closing ranks and shutting raver outs. “We don’t have a choice in the matter,” says Montreal event organize Jessica Jazhanns. “After the BIPLO deaths, the police are cracking down hard on parties again. It almost feels like the hysteria of 1999 is back in full swing. In order to throw our events unmolested by the police, we’ve had to throw ravers under the bus." 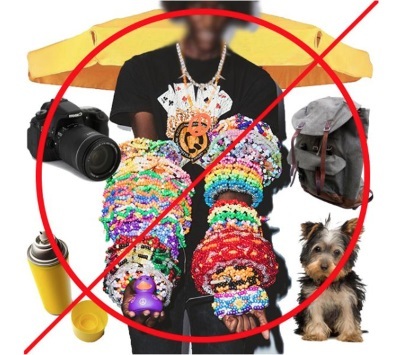 Starting this summer, nearly all major promoters in Montreal will ban people from wearing raver related fashion staples at their events. “We can’t realistically stop ravers from attending our events,” says Jessica. “But we can force them to wear normal people clothing." That mans no more masks, no drugs, no bongs, no led gloves, no pacifiers, no eye drop, no fun fur pants, no stuffed animal, no fake animal tails or ears, no machetes or syringe needles. “Seriously, when the hell did ravers start carrying machetes around,” asks Jessica. “It’s bad enough they’re always taking drugs and dancing like lunatics, but now they’ve started waving around machetes like they’re glowsticks." Some people believe that machete waving might have been the straw that broke the raver’s back. “I don’t think the people at BIPLO would have died if they hadn’t attacked each other with machetes,” says 45 year old psytrance fanatic Harry Oldman. “Sure, they only attacked each other because they were high on bath salts, but would they have been successful in killing each other if they didn’t also have machetes on hand? I don’t think so. Raving isn’t what it used to be. Back in my day, ravers were are all about PLUR, not bath salts and machete mayhem."